Did you know that employers can conduct 10 video interview screenings in the time it takes to conduct one phone screen? The benefits of using video interviews in your hiring process are undeniable. And if you’re already using the video interview in your hiring approach, you likely already know how much time and pain it can save in your hiring process. 1. Don’t forget to ask questions that gauge specialized skills. 2. Optimize the questions you ask using behavioral interview questions. As we all know, the questions you ask your job candidate in an interview are very important in gaining an understanding of your applicant’s skills. But consider optimizing the questions you ask to gauge a few other topics, such as preferred management style, past work environments and experiences, career goals or job expectations. For example, a job candidate might be a serial job hopper and not in the position for the long run. While their resume might tip you off to this, you may find by asking a question about future career goals that your industry and company is exactly where this job hopper has been wanting to hop to. Other examples of behavioral interview questions force the candidate to describe concrete examples of how they utilized their skills in the past. 3. Take your time with the one-way interview. Let’s face it, we’re all too busy these days. With traditional interviewing, it takes a lot of time to pre-screen job candidates, ask interview questions and lead the job candidate in and out of your office or building- not to mention job candidates that come late. This all culminates to a large chunk of your day you can never get back. Using pre-recorded video interviews allows you to cut down the time it takes to pre-screen job candidates, the time it takes to ask the interview questions yourself, and completely eliminates the time it takes to conduct phone interviews. You can also start or stop them any time, giving you more flexibility in your hiring process. But if you want to hire better, make sure you are taking advantage of these time-saving tips. Try weeding out candidates within the first few questions if you’re not feeling their answers, divide the work with other team members, or even watch the videos over a week’s period whenever you have free time. 4. Share the interview with your team. Video interviews are optimized to help your team collaborate on new hires. Whether you choose to conduct Spotlight Interviews or Live Interviews, there are options to easily share the interview with your team. Live Interviews are recorded for you to share with your team or watch again at another time. Spotlight Interviews also offer the same perk, as they are made to be shared with your team as well. These benefits let you get your team involved in the process, encourage collaboration, and even allow you to delegate some hiring tasks. Make the most of video interviewing by taking into account these four tips and enjoying the time-saving benefits of using video in your hiring process. What tips and tricks do you recommend for hiring managers wanting to get the most out of video interviewing? How Do I Video Interview… A New Member for an Existing Team? 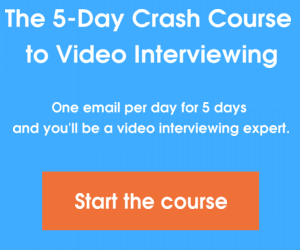 How Do I Video Interview… For a Customer Service Position?